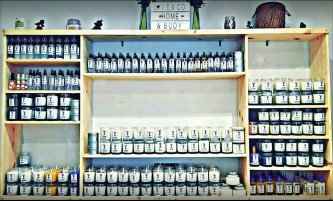 At Love & Co Candles we custom create your favorite scents on site. Our environmentally friendly soy candles can be purchased in our Riverside location and at certain local farmers markets and craft shows. Making everything in-house allows us to control the quality of the candle that you will be receiving. For the price do you want a candle you have to stand next to in order to smell it? Or one that burns through in one to two lighting sessions. Come to enjoy some time in our eclectic shop and pick up some wax melts, candles, home sprays, and body oil.